The session was a follow-up to an April 9 listening session. 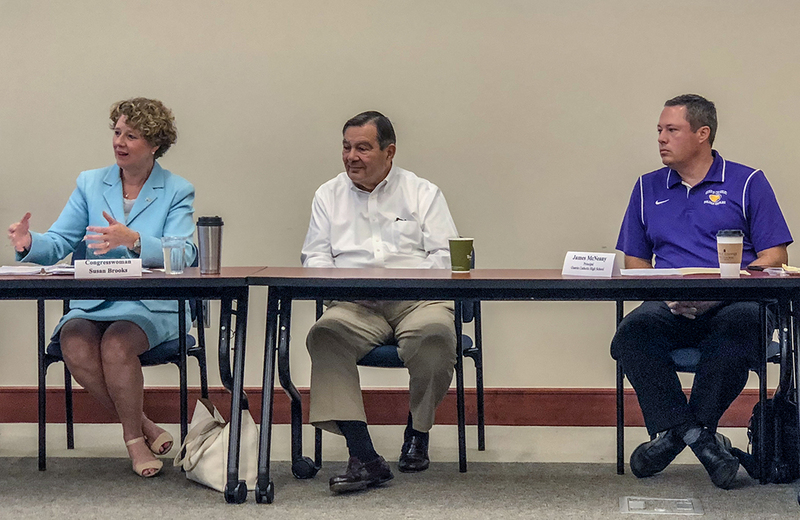 Brooks said the Aug. 24 session drew approximately double the attendees of the April event, which she attributed in large part to the enhanced focus on school safety following the May 25 shooting at Noblesville West Middle School. Roundtable topics included the importance of informing parents on when and what drills are practiced within the schools so they can follow up with their children. “A lot of us (parents) grew up with fire drills and so forth, but the active shooter drills which have been going on for quite some time now, many parents didn’t go through that and don’t understand it,” Brooks said. Westfield Washington Schools Director of HR and Safety Chris Baldwin spoke on how WWS keeps parents informed. One reason Alexandria Community Schools Supt. Melissa Brisco attended was to learn the best way to respond when an emergency happens. Brisco said she thought she could learn a lot by hearing from Noblesville Community Schools Supt. Beth Niedermeyer. “I wanted to learn from Beth because she did a fantastic job managing a really horrible situation last May, and she’s learned some lessons from that, and I would like to learn from her,” Brisco said. Niedermeyer spoke on the importance of internal and external communication within a school during a crisis situation. A downside to social media is that rapid information is not always factual. MSD Washington Township Chief of Police Brian Clouse said a third-party vendor might be a future option for accurate communication. “That piece is critical because social media is going to beat you to it, and disinformation is the wrong information,” he said. Brooks established the listening sessions and is co-chair of the Congressional School Safety Caucus, where she meets with local schools and law enforcement leaders to discus new and innovative methods for keeping schools safe. For more, visit susanwbrooks.house.gov.